LORMAN, Miss. 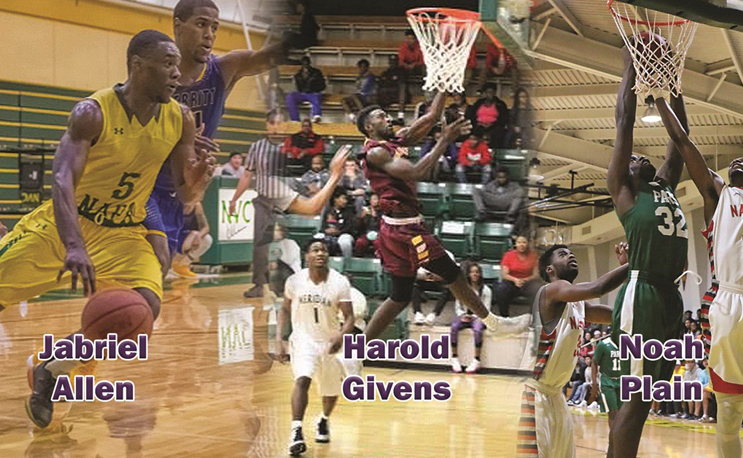 – The Alcorn State University men’s basketball program added more depth and athleticism to its 2017-18 roster with the signing of Jabriel Allen, Harold Givens and Noah Plain, head coach Montez Robinson announced. “The fans will really enjoy watching Jabriel, Harold and Noah on the court. They will add to the excitement around our basketball program that we’ve been building over the last couple years,” Robinson said. Allen is a 6-3 guard from Muncie, Indiana. He comes to Alcorn after averaging 20.0 points per game over 26 games this past season at Napa Valley CC. He also shot .447 from three-point range and .779 from the free throw line. “Jabriel is a really explosive player and will bring a lot of leadership to the team. He can score at all three levels which is something we haven’t had since I’ve been here. I’m really excited for what he’s going to bring to the team,” Robinson said. Allen poured in a season-high 43 points at Merritt on Jan. 25, 2017. He scored at least 30 points on four other occasions. Allen drained at least five three-pointers in nine different games. In 2015-16, Allen played his freshman season at Snow College (Utah). He’ll have two years of eligibility remaining at Alcorn. Allen is a product of Muncie Central HS. Givens is a 6-7 forward who was born in New Orleans and grew up in Columbus, Georgia. He played his freshman season at New Mexico State, choosing the Aggies over Florida International. “Harold is a phenomenal athlete. He’s very versatile and can play nearly every position on the court both offensively and defensively,” Robinson said. Givens transferred to Pearl River CC where he shot .557 from the field last season. He scored in double-figures four times including a pair of 17-point outings. Givens will have two years of eligibility remaining at Alcorn. Givens played prep ball at Faith Baptist Christian School in Brandon, Florida where he averaged 22 points, eight rebounds and five blocks a game. Givens was an All-Conference performer and All-Bi-City Second-Team. Plain is a 6-7 forward from Baton Rouge. He comes to Alcorn as a sophomore after spending the last year at Paris JC. Plain was ranked the No. 62 prospect in Louisiana out of high school by maxpreps.com. He played at Tara HS. At Paris JC, Plain shot .648 from the field on the season and scored in double figures five times. Allen, Givens and Plain join combo guard Troymain Crosby and forward Dante Sterling as newcomers to the 2017-18 roster.